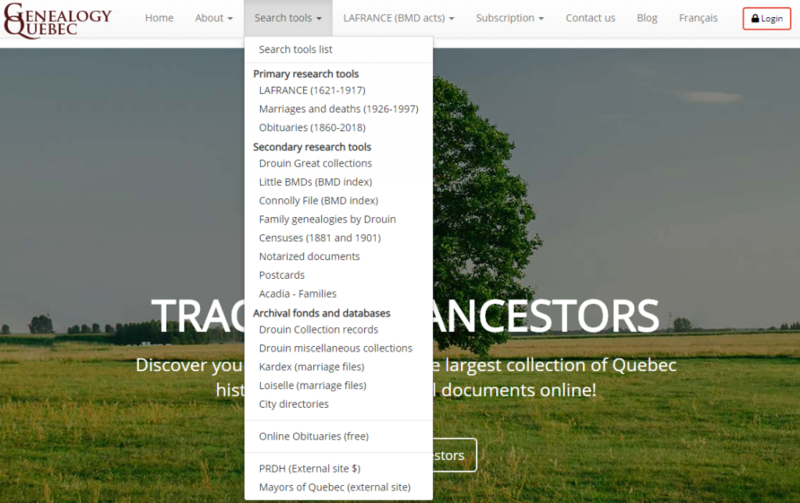 This guide will help you navigate the various pages and collections available on GenealogyQuebec.com. 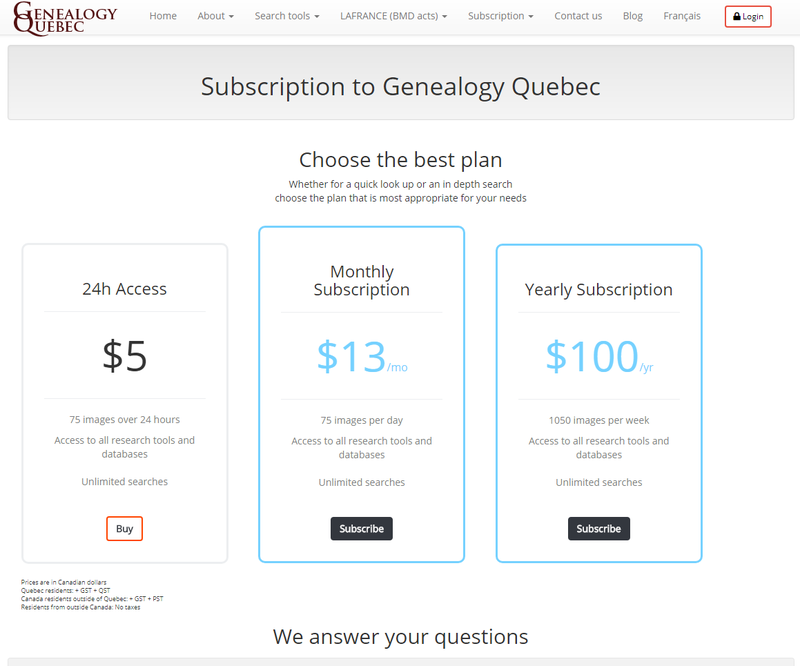 GenealogyQuebec.com’s tools and collections require a subscription to use. In order to subscribe, head over to the subscription page, and select the subscription of your choosing (24h, 1 month, 1 year). After selecting your subscription option, you will be redirected to the account creation process, where you will need to enter your email address as well as a username and password of your choosing. Once you have entered and validated your account information, your account will be created. You will then be prompted to purchase your subscription. On the subscription purchase page, you will be asked to select your payment method (Paypal or Credit Card) as well as to confirm your subscription option. Clicking on the “Pay” button will redirect you to Paypal or Stripe, depending on your payment method, and allow you to proceed with the payment. Your subscription will be activated as soon as the payment is processed, which should be instant. Please note that you can also subscribe by phone using your credit card by calling us at 514-400-3961. If you’ve subscribed using Paypal or your credit card, your subscription will be set to renew automatically. To cancel this automatic renewal, head over to the unsubscribe page and click on “Stop the automatic payments”. If you’re having trouble with this process, contact us at contact@institutdrouin.com or 514-400-3961. 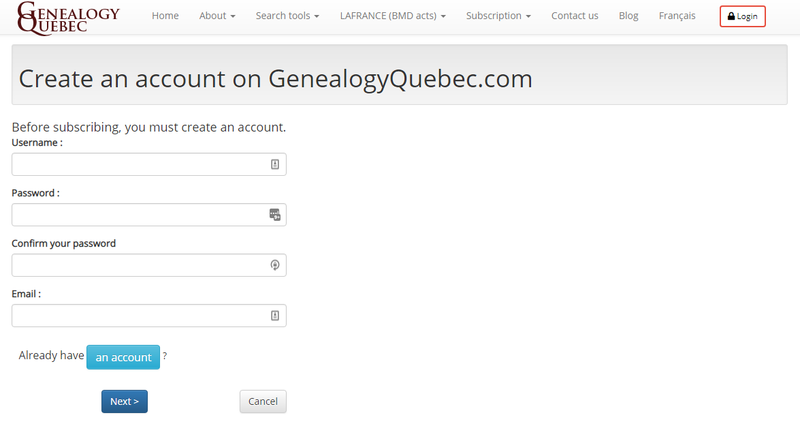 To start using your subscription, you must log into your Genealogy Quebec account. To do so, head over to the login page and enter the username and password you have selected earlier. If you have lost or forgotten your password, head over to this page and enter your email address. You will receive an email containing a link which will allow you to select a new password for your account. To access Genealogy Quebec’s tools, you can use the “Search tools” tab in the menu bar. Genealogy Quebec’s tools are separated in 3 categories. 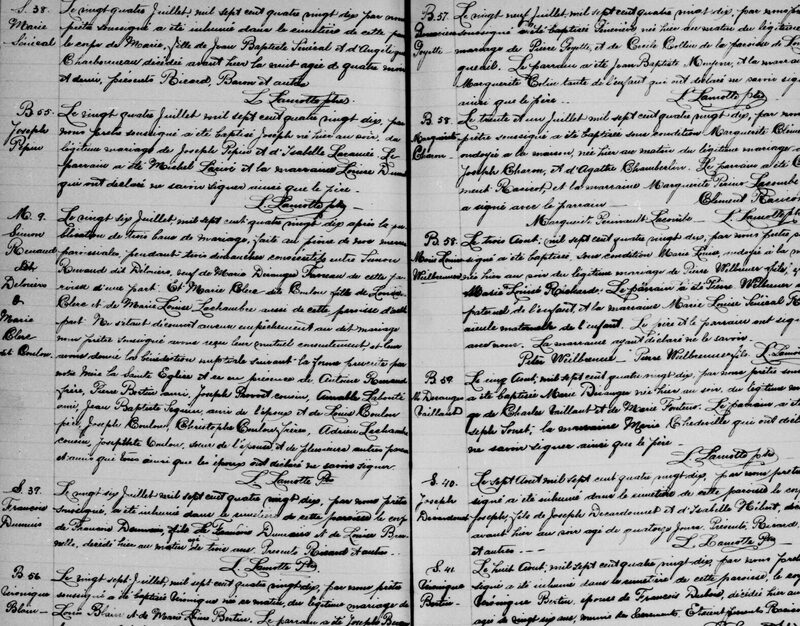 This section gives you a concise overview of the period, regions and type of documents covered by each of Genealogy Quebec’s tools. Complimentary information is included between parenthesis when the period, region or type of document is only partially covered by the tool. You will find a more detailed version of this research helper on this PDF file.